As genuine as the real thing without being carbon dateable, the retro-spectacle Seedy Three is our back-to-the-future tribute to the famously infamous slab-carrying Crumpler CD3 of the early nineties. Cut from different cloth to our modern day messenger line up, The Seedy Three is made from ol’ school waxy canvas and reapplies the original bag’s one-piece construction technique, heavy-duty box stitching, edging and show through detailing – right down to the v1.0 Crumpler logo and badging. 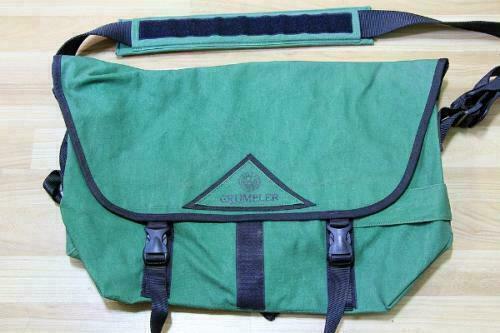 The features of that first hard-core courier carryall have also carried over to today’s Crumplers, which is why the Seedy Three sports an adjustable shoulder pad, QuickFlick™ buckle system, triple velcro flap seals, dual compressions straps and third leg stabiliser. To ensure you can put lots of stuff in and get to it pronto, we first put in lots of thought. That’s why the Seedy Three’s no frills main compartment is both a whopping 20 litres big, and wide enough to swallow a 17-inch laptop in a single gi-normous byte. And why the interior also features a deep, velcro-fastened centre pocket plus left and right deep stuff pockets for your everyday e-ssentials. Seal the Seedy Three’s outer flap with its trio of oversized, injection moulded velcro fasteners and even the most dexterous pocket pickerer will struggle to get their mischievous mitts in unnoticed. The more stuff you carry, the more you need a wide strap to distribute its weight – and the more you’ll appreciate the Seedy Three’s soft but strong 50mm flamed polypropylene webbing and adjustable shoulder pad. Complete with QuickFlick™ buckle system, it will go to almost any lengths to ensure the bag sits right where you want it. See that extra little strap thingee dangling off the Seedy Three’s shoulder strap? It’s our 11 herbs and spices secret recipe third leg. Clip it under your left arm, then adjust your strap lengths and shoulder pad position. Badabing! The bag is stable and your load is on your back right where it should be. FOR INTERESTED BUYERS, YOU CAN SMS ME AT +65 9448 2390. PICK-UP POINTS ARE AT ORCHARD MRT AND BISHAN MRT STATIONS. Environmental-friendly Canvas Love Birds Shoulder Bag @ $5. Means: 43.5x43.7cm. Condition: New. Postage fee @ $1.15. Self-collect @ Buangkok Crescent. Whatsapp: 90260492. Preloved, 100% authentic, comes with the original receipt RTP550. Selling only 200, +$1 for shipping Whatsapp me for fast deal thanks! No low ballers! Not for fussy buyers! Material: Leather Zip closure Purely handmade Brought back from Italy.